The first few weeks of the New Year are a good time to reflect on how lucky we are to work in agriculture. For many, the farm lifestyle is as, if not more, important than making money. Yet farms are still businesses, and many young farmers aren’t spending enough time managing their farm’s finances. Many beginning farmers starting their businesses don’t know how to budget for expenses, or how much they’ll make producing a given agricultural product. There can be a lot of mystery around the financial side of farming. How profitable are eggs versus cucumbers? Sheep versus pigs? This year, the 12 Month Farm Finance Challenge seeks to answer those questions and more, in real time, on real farms. John Suscovich, farm manager at Camps Road Farm in Kent, CT and creator of the online resource Farm Marketing Solutions, developed the 12 Month Farm Finance Challenge as a way to keep himself accountable. As a young farmer, he knew he wasn’t tracking the financial side of his farm adequately. The Challenge started as a personal one, and grew into a desire to help other farmers learn about their finances. Now, nine farms, including Suscovich’s Camps Road Farm, are taking part in the Challenge. Each month, starting in early February 2015, the nine participating farms will publish their income reports, income and expense breakdowns, production reports, labor expended reports, and other information online on the Farm Marketing Solutions blog. The information posted each month will reflect the farm’s activity of the previous month; for example, February’s posting will reflect January’s business activity. Farms will post their financial information every month through December 2015, and the Challenge will conclude with a year-end summary of lessons learned. As the Challenge proceeds, we’ll be able to see in real time how expenses shift with the seasons, how agricultural products affect monthly income, and how that money is spent. Beyond the financials, each of the participating farms will have a feature page on Farm Marketing Solutions highlighting farm size, what is grown, why they are participating in the Challenge, and what they hope to achieve throughout the process. Participating farmers will also be interviewed by Suscovich for his Growing Farms Podcast. Intended to help growing farmers succeed, the Growing Farms Podcast covers all manner of farm-related topics, from what breed of chickens to raise for meat or how to boost your marketing game to the ins and outs of hiring farmworkers. Farm Marketing Solutions also offers free tutorials including how to develop a website with no prior experience in web design. The 12 Month Farm Finance Challenge will give young farmers an inside look at the financial realities of farming, and the opportunity to learn from farmers who are growing their businesses and learning themselves. Suscovich recently kicked off the Challenge by posting his 2015 Pastured Broiler Budget on the Farm Marketing Solutions homepage. We’ll be following up with Suscovich here on the NYFC blog later this year to track the progress of the challenge. If you’d like your farm to participate in the Challenge, there’s still time to get involved. Contact Suscovich directly for more information. 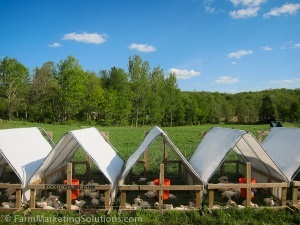 « previous article: NYFC Releases "A Farmer's Guide to Working with Land Trusts"